Within a single generation, digital media and the World Wide Web have transformed virtually every aspect of modern culture, from the way we learn and work to the ways in which we socialize and even conduct war. But is the technology moving faster than we can adapt to it? And is our 24/7 wired world causing us to lose as much as we've gained? In Digital Nation: Life on the Virtual Frontier, FRONTLINE presents an in-depth exploration of what it means to be human in a 21st-century digital world. Continuing a line of investigation she began with the 2008 FRONTLINE report Growing Up Online, award-winning producer Rachel Dretzin embarks on a journey to understand the implications of living in a world consumed by technology and the impact that this constant connectivity may have on future generations. "I'm amazed at the things my kids are able to do online, but I'm also a little bit panicked when I realize that no one seems to know where all this technology is taking us, or its long-term effects," says Dretzin. Joining Dretzin on this journey is commentator Douglas Rushkoff, a leading thinker and writer on the digital revolution -- and one-time evangelist for technology's positive impact. "In the early days of the Internet, it was easy for me to reassure people about what it would mean to bring digital technology into their lives," says Rushkoff, who has authored 10 books on media, technology and culture. "Now I want to know whether or not we are tinkering with something more essential than we realize." Dretzin and Rushkoff begin on the campus of the Massachusetts Institute of Technology, home to some of the most technologically savvy students in the world. Many of these "digital natives," who have hardly known a world in which they weren't connected 24/7, confess to having increasingly limited attention spans that make it difficult for them to read books or learn in conventional ways. "Honestly, I can't sit somewhere for two hours straight and focus on anything," says a student named Alex. "Maybe it's some technology dependence I've developed over the course of the years, but at this point I don't think I can go back to just focusing on one thing." "I teach the most brilliant students in the world," says MIT professor and clinical psychologist Sherry Turkle, who describes the challenges of teaching students who are surfing the Internet and texting during class. "But they have done themselves a disservice by drinking the Kool-Aid and believing that a multitasking learning environment will serve their best purposes. There are just some things that are not amenable to being thought about in conjunction with 15 other things." A multitasker herself, Dretzin travels to California to the Communication Between Humans and Interactive Media (CHIMe) Lab, where Stanford professor Clifford Nass has been studying the effectiveness of self-proclaimed multitaskers. After taking one of Nass' tests, Dretzin is shocked by her poor results. "It turns out multitaskers are terrible at every aspect of multitasking. They get distracted constantly. Their memory is very disorganized. Recent work we've done suggests they're worse at analytic reasoning," Nass tells Dretzin. "We worry that it may be creating people who are unable to think well and clearly." But supporters of teaching with technology say it is vital for educators to keep students engaged by using the tools students have so thoroughly mastered in their everyday lives. "We have to be interactive, because [students] are accustomed to sitting in front of a screen, and they've got five windows up, and they're talking to three people at the same time," says Michael LaSusa, co-principal of New Jersey's Chatham High School. "We have to capture the attention of students. We almost have to be entertainers." In the South Bronx, Digital Nation finds administrators at a local public middle school who credit increased use of technology with helping boost both student attendance and standardized test scores. Beyond school, Digital Nation explores the phenomenon of multiplayer online games like World of Warcraft and 3-D virtual worlds like Second Life -- online destinations with millions of participants. Last summer, Rushkoff and Dretzin traveled to BlizzCon, a giant party Blizzard Entertainment throws every year for its fans. Many of the people they spoke to there had never met, but considered each other close friends. "We've all spent hundreds of hours together," one gamer tells FRONTLINE. "My traditional-style friends who I have outside the game, none of them do I spend 16 hours a week with, week in and week out. I mean, I've known some of these folks for years." "Technology over the last 50 years has mostly separated us," Second Life founder Philip Rosedale tells Rushkoff. "We've gone from watching movies together to watching them in living rooms to watching them on iPods. And I think that technology is starting to bring us back together again." As more people become deeply immersed in these popular sites and are having profound experiences via online personas, or avatars, researchers are studying real-world effects of virtual immersion. Rushkoff visits Jeremy Bailenson, director of the Virtual Human Interaction Lab at Stanford University. "Digital stuff is such a new phenomenon that if it looks real and feels real, the brain tells us it is real," says Dr. Bailenson. "We've done studies with children where they see themselves swimming around with whales in virtual reality. ... About 50 percent of them will believe that in physical space, they actually went to SeaWorld and swam with whales." 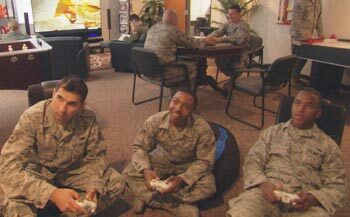 FRONTLINE also examines how digital technology has transformed many aspects of warfare, from a controversial Army recruitment center that offers teens as young as 13 free access to commercial combat video games to Air Force pilots who sit at a base in Nevada but fly drones over the war zones in Iraq and Afghanistan to treating returning veterans' post-traumatic stress disorder with virtual reality therapy. "This disconnect of being at war and being at home is very tough for the human mind to wrap itself around," P.W. Singer, a senior fellow at the Brookings Institute, tells FRONTLINE. "And we're finding that some of these drone pilots actually have combat stress and PTSD even, just like the units physically deployed into Iraq and Afghanistan." The Digital Nation Web site launched more than 10 months before the broadcast as part of FRONTLINE's first multiplatform project, publishing short online video reports in addition to a producers' blog and a mosaic of user-generated content called Your Stories designed to let visitors participate in the documentary process. The site also features embeddable video, and an archive of online events with expert guests. Self-guided online workshops for teachers and parents can be found here.